Russell Crowe plays the title character in “Noah,” now playing in area theaters. Here is a small list of groups who, no doubt, have a right to be miffed at the final version of Darren Aronofsky’s “Noah”: pious Jews, Christians and Muslims (the tale of Noah and the flood is in the Quran too), literary scholars, movie lovers and parents who just hoped they could take their kids to a big, exciting and enjoyable bit of Hollywood pseudo-biblical malarkey full of wonderful animals. Here is a relatively complete list of people who may be happy with the film: conservationists, those Comic-Con folks who believe in the primacy of special effects in movie fantasies, crusading vegetarians, soap opera fans and devoted adherents to the decidedly dubious notion that there’s nothing in any story that’s ever been told in the history of civilization that couldn’t be improved by a Hollywood rewrite. 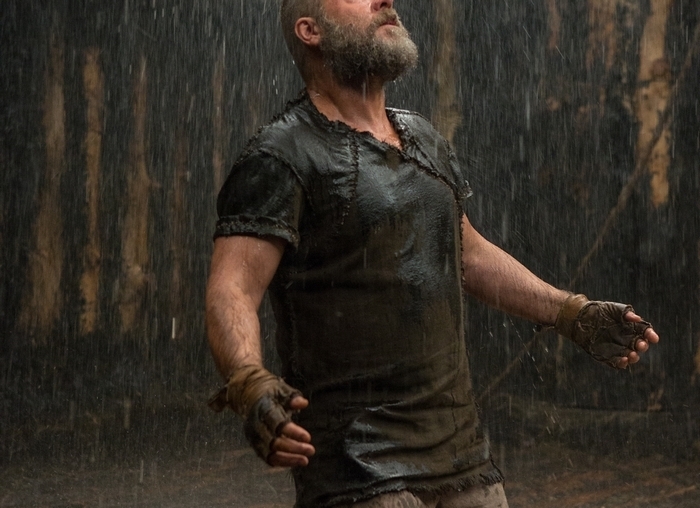 Let’s be blunt: I really wanted to like Aronofsky’s “Noah” – every penny’s worth of its supposed $130 million budget. I have been avidly interested in everything he’s done since he made, for $60,000, one of the most astonishingly creative major film debuts by an American filmmaker of the past 25 years, “Pi,” an amazing film about a number theorist that didn’t stint on mathematics. How wrong could he go with “Noah”? We’re talking about one of the greatest stories ever told in that universally known repository of some of the greatest stories in the history of our species. The tale of Noah is the first apocalypse story of them all and arguably the best. Whatever one’s feelings about the Bible as Revealed Truth (Noah, remember, was supposedly 600 years old when it all happened), it is uncontestably a majestic, near-inexhaustible source of some of the greatest stories we know. Sure, we’re used to it now in the comedian’s version – Bill Cosby’s wonderful take (“Lord? What’s an ark?”) and Steve Carrell’s considerably less wonderful “Evan Almighty,” – but that doesn’t mean that a provably brilliant filmmaker shouldn’t take a whack at taking it seriously on film. Somewhat incredibly, the best “Noah” story on film remains John Huston’s version in “The Bible: In the Beginning,” from 1966. In that one, a great filmland megalomaniac and moneybags (Dino DeLaurentis) had the bright idea of doing the Bible, start to finish, on film with the greatest talents in movies, only to see them all drop out but Huston, always game for an absurd challenge and a quick way to settle gambling debts. When you watch Russell Crowe play Noah, you’re watching a big-hearted fanatic and near-clinical depressive. The news that mankind had become so wicked that his deity was going to wipe everyone out except inhabitants of a big boat could depress anyone. Huston, on the other hand, decided to play Noah himself after trying and failing to lure Charlie Chaplin back to do it. His version of Noah – which I now, officially, love compared to Crowe’s – is a kind of genial host to all of the earth’s creatures at a very peculiar apocalypse and end of the world party. When he gets drunk later in the tale (it’s all in Genesis; tradition has it that Noah was the first ever to get drunk), Huston, a famous tippler, was clearly in his element. I wouldn’t dream of pretending there’s nothing to see in this version of “Noah.” But it’s not enough – not nearly so for me, anyway. Because of the actors involved and the primal soap opera difficulties of Noah’s family – the primal rivalry of sons Shem and Ham, the barrenness of Ila – the emotions can be moving and the flood scenes can be impressive. Unfortunately, almost comically bad are the “watchers,” fallen angels once made of light but now monsters made of stone. They’re the family’s protectors and day-laborers building the ark. None of it is enough. The Scripture’s writers were incomparably better. The movie is like a grand, majestic soap opera where Dad has the most demanding boss in all of creation and is going a little crazy because of it – which is a huge trial to his whole family. If no one minds me raising my hand to ask an appallingly obvious question, what the devil is the point of spending $130 million in a story of Noah and the Ark giving the animals the shortest of short shrifts? We do get some impressive CGI when, in the space of minutes, all the birds and then all the snakes and reptiles show up two by two for heavenly duty on the H.M.S. Noah. But, after that, forget it. No individual animals really are either cute or scary. Naameh –Mrs. Noah (Jennifer Connelly) – develops some knockout incense for the animals and the whole ark full of critters is asleep throughout the movie. And, there, I say, went all the of the potential fun to be had in 138 minutes of screen time. In doing some research, I encountered some great Noah tales from Jewish folklore – that, for instance, the ark’s notable sanitation problems caused Noah to create two new animals. He passed his hand over the elephant who then gave birth to a pig to devour the filth. Then, to deal with the exploded rat population, he rubbed the lion’s nose and created a cat which took care of the growing army of rats. For the record, Anthony Hopkins, as always, is tonally perfect as Methuselah, Noah’s grandfather. The movie certainly has its moments from Connelly and Emma Watson, too.